An escape within an escape. Exhilarating days of discovering the world deserve an equally wonderful place to recharge. Revel in stylish design. Sink into exquisite bedding. Bask in the breathtaking views. Our array of luxurious accommodations has been created artfully to make your stay warm and welcoming. Your guests will enjoy spacious, well-appointed staterooms and suites. Fleet-wide, more than 75 percent feature private verandas, perfect for breakfast at sunrise, drinks at sunset, and panoramic views any time. Spacious staterooms, spectacular suites, superlative service: Could any hotel or resort on land be quite as accommodating? As an Iconic Suite guest, you’ll feel like you’re on top of the world—literally. High above the bridge, these all-new suites offer panoramic views from front to back. With over 2,500 square feet of indoor and outdoor opulence, they’re the largest, most luxurious in our fleet. The expansive outdoor space includes chic furnishings, private hot tub, and double daybed. Iconic Suites offer two bedrooms, each with a king-sized bed from our Cashmere CollectionSM and two full bathrooms featuring full shower, whirlpool tub, and nothing but the best amenities. It’s enough space for six guests to unwind comfortably. There’s even an in-suite butler’s pantry for those occasions when you feel like entertaining. For the ultimate indulgence at sea, go Iconic. Combine all the innovative amenities of our Celebrity Edge staterooms with the many exclusive benefits of Suite Class. Penthouse Suites feature a master bedroom, bathroom, dressing room, living/dining area, guest bedroom and bathroom, and private terrace with hot tub. Guests also enjoy an attentive butler, so they never have to lift a finger. The suites offer all the latest technologies, allowing guests to adjust their comfort features precisely and conveniently. With a simple touch screen, the in-room automation allows them to control lighting, temperature, and more. You can even set the system to tuck you in at night and wake you up in the morning—service at the touch of a button. Celebrity Edge takes the Penthouse Suite experience to new heights of luxury and indulgence. Luxurious Edge Villa residences are the first of their kind in our fleet. In these six private oceanfront villas, indoor and outdoor living is blended seamlessly, with two stories of windows that overlook the terrace with inviting lounge furniture, the three-foot-deep plunge pool, and incredible views beyond. Each offers a spacious 950 square feet of split-level splendor, plus a bedroom and two bathrooms—perfect for up to four guests. The open, airy environment truly invites the outside in. Edge Villas not only offer private outdoor terraces but also give direct access to The Retreat, an exclusive area for Suite Class guests. Step out to The Retreat Sundeck, Retreat Pool, and Lounge. Spread out in separate living and dining areas and a private veranda with comfortable lounge seating and whirlpool. Exclusive lounge. Enjoy Michael’s Club, with complimentary cocktails, canapés, and dedicated concierge services. Private restaurant. Mouthwatering meals await in Luminae, only for Suite Class. Personal butler. Dedicated attention will ensure guests never have to lift a finger. Luxurious details. Guests enjoy complimentary in-suite espresso and cappuccino. Exclusive lounge. Guests enjoy complimentary cocktails, canapés, and dedicated concierge services in Michael’s Club. Private restaurant. 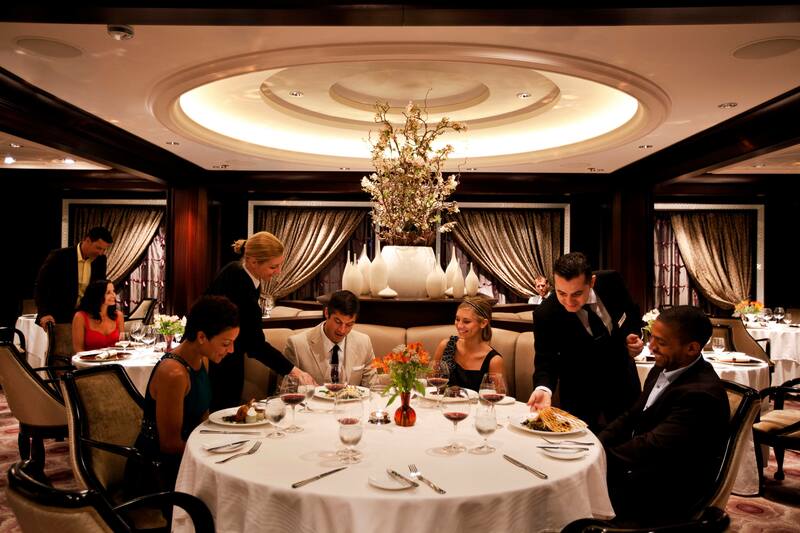 Guests savor mouthwatering meals in Luminae, a restaurant reserved for Suite Class guests. Private butler. Get assistance with unpacking, packing, and in-suite lunch and dinner. Luxurious details. Guests enjoy complimentary in-suite espresso and cappuccino from Café al Bacio. Private restaurant and lounge. In Luminae, guests enjoy mouthwatering meals morning, noon, and night. In Michael’s Club, enjoy cocktails, canapés, and dedicated concierge. The industry-first Magic Carpet is both the best way to take in spectacular views and the most exciting place to be. Designed with comfortable seating, a full bar, and space for live music performances, it truly is a destination itself on Celebrity Edge. This culinary experience—eclectic dishes with extraordinary service—caters exclusively to Suite Class guests. Exclusive restaurant. The specialty restaurant Blu features “clean cuisine” for a healthier twist on the classics. Spa elements. AquaClass guests enjoy spa elements infused into their stateroom experience, unlimited access to the Relaxation Room (on Celebrity Solstice® Class) and Persian Garden, plus more soothing extras. Spa concierge. Guests consult with their personal spa concierge to plan the perfect treatments for the most rewarding experience. Discover a room that’s more than a room. It’s an experience. Our meticulously designed Concierge Class staterooms feature new services, amenities, and events. Premium locations. Concierge Class staterooms are well-appointed retreats in some of the most desirable locations of the ship. Dedicated service. A team of professional concierges take care of all your needs. Canapés and more. Guests enjoy a number of special perks, including a welcome gift of fresh fruit and sparkling wine, daily canapé deliveries, and an exclusive destination seminar. Priority check-in and departure. Guests are greeted and assisted by their concierges from their first moments on the ship until they head back home. Welcome lunch. Concierge Class guests enjoy their own exclusive welcome luncheon in the main restaurant. Enjoy luxurious open-air access to the sea whenever you wish. The most transformational aspect of Celebrity EdgeSM stateroom design is the Edge Stateroom with Infinite Veranda. With the touch of a button, it takes your room right out to the water’s edge. The entire living space becomes the veranda, and it means more room to move around during the day. These staterooms not only provide the latest design and technology but also more space. They are 23 percent larger than our award-winning Celebrity Solstice® Class veranda staterooms. In another modern luxury first for us: 99 percent of the staterooms on Celebrity Edge feature king-sized beds, with bedding selected from our exclusive Cashmere CollectionSM and mattresses handcrafted in Italy. The Edge Stateroom with Infinite Veranda means more ways to configure rooms. In fact, there are 174 different options to connect staterooms. Plus, we’ve designed a whole new stateroom category, the Edge Single Stateroom with Infinite VerandaSM, for modern travelers who love to explore the world on their own. Large windows offer sweeping ocean views. In the spacious sitting areas, guests can kick back and relax after a day that has been as busy or relaxing as they want. This stateroom becomes your home away from home, with ample living space. Guests can relax on the sofa in the sitting area after their day of discovery. Exclusive lounge. Relax in Michael’s Club, offering complimentary cocktails, canapés, and dedicated concierge services. Private restaurant. 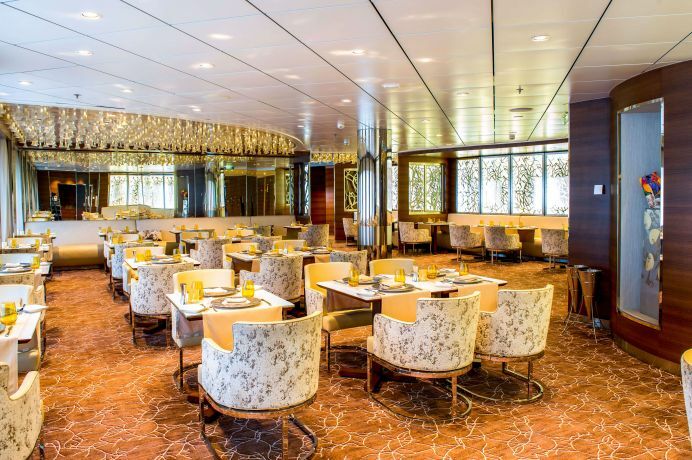 Guests savor mouthwatering meals in Luminae, only for Suite Class. Personal butler. Guests will never have to lift a finger. Exclusive perks. Get a butler’s pantry and two interactive entertainment systems. VIP treatment. In the exclusive Michael’s Club, guests enjoy complimentary cocktails, canapés, and dedicated concierge services. Dedicated butler. Every need will be attended personally. One-of-a-kind—literally—Reflection Suite is an expansive two-bedroom, two-bath layout with a shower that extends out over the sea. A personal butler. You never have to lift a finger. A private restaurant. Luminae, serves from menus available nowhere else. An exclusive lounge. Michael’s Club, offers complimentary cocktails, snacks, and concierge service. Only on Celebrity Reflection, guests relax in airy rooms featuring high ceilings and floor-to-ceiling glass doors and windows. Spacious veranda. Lounge seating beckons guests to unwind with breathtaking scenery. Personal butler. Dedicated attention tends to guests’ every need. Private restaurant. In Luminae, guests enjoy mouthwatering meals morning, noon, and night. Personal butler service. Guests never have to lift a finger on vacation because they’ll have an attentive butler. Private restaurant access. Luminae is a culinary experience of modern, eclectic cuisine, and extraordinary service. Exclusive lounge access. Guests enjoy access to Michael’s Club, where they can relax with a cocktail in hand. A luxurious 24-hour private lounge exclusively for Suite Class guests and Captain’s Club Zenith members, Michael’s Club features continental breakfast or later for drinks and tapas. A dedicated concierge helps to arrange your specialty dining and shore excursions—even handle inquiries about ports of call. Discover a stateroom that’s more than a stateroom. It’s an experience. Our meticulously designed Concierge Class features new services, amenities, and events. Canapés and more. Guests enjoy a number of special perks, including a welcome gift of fresh fruit and sparkling wine, daily delivery of canapés, and an exclusive destination seminar. Spa elements. AquaClass guests enjoy spa elements infused into their stateroom experience, unlimited access to the Persian Garden, plus more soothing extras. Celebrity’s newest addition to the Galapagos fleet. The Vista is the hotspot in the Galapagos Islands to do it all. The largest, most luxurious suites sailing the Galapagos islands. With up to 1,288 total square feet of indulgent home-away-from-home comfort, these lush havens are the ultimate compliment to this extraordinary destination. The Royal Suite is a modern refuge thoughtfully designed to pamper guests and highlight the destination. Experience 559 total square feet featuring a separate living area, bedroom, and private veranda. New to the Galapagos Islands is the Infinite VerandaSM. A key transformational element, this game-changer virtually takes your entire room to the water’s edge with the touch of a button. Transform your suite to an open-air room with the touch of a button and experience a greater connection to the Galapagos Islands landscapes. Sky Suites with Infinite Veranda℠ feature a modern layout with an etched glass divider and face outward for stunning views from the moment you wake. The Sky Suite with Veranda offers a total of 330 square feet, including a private, spacious (84 square feet) veranda. The signature Cashmere CollectionSM Bedding invites you to sink into it. In fact, it’s so indulgent, we dare you to have a better night’s sleep anywhere else. A hot tub and sunning area are all it takes to unwind from head to toe after a day’s exploration. Explore the islands that inspired Charles Darwin from the height of Galapagos Islands luxury. Experience extraordinary creature comforts while meeting extraordinary creatures. Natural beauty is on display through floor-to-ceiling glass doors to your private veranda. Soak in the equatorial sunsets from your private veranda in these elevated accommodations. Enjoy your sitting area in comfortable accommodations. Enjoy two convertible beds and exceptional ocean views. Relax in comfort after a full day of exploration. Featuring full bar service, daily briefings, movies, and lectures and entertainment. Spread out with two convertible beds and exceptional ocean views. Watch sunsets from the sitting area in these accommodations. Relax in your home at sea after a day of exploration. Enjoy an Early Riser continental breakfast and lunch daily under the open air shade canopy in addition to specialty drinks and music. Find the perfect meeting space for any agenda. Each ship offers something a little different; all have the exact venue you want.